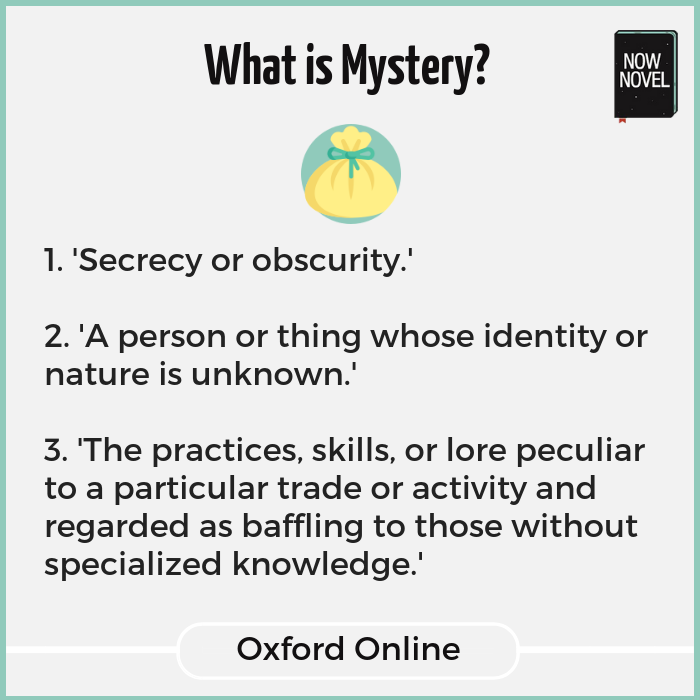 From the first two definitions, we see why mystery is important to all genres. There is mystery in a romantic story, for example. When two potential lovers’ eyes meet across a room and they feel instant connection (like in Romeo and Juliet). This is a mystery of identity (the second definition). When we read an incredible hook that makes us wonder what events a narrator is referring to, that’s mystery (the first definition). So what can you do to create a sense of exciting unknowns approaching fuller revelation? ‘Foreshadowing’ means a ‘warning or indication of (a future event)’ (Oxford Online). In a story, this could also mean a hint of an event that happened in the past, but will be revealed in full later in the story. This is one of the gifts of storytelling – we can create future anticipation in readers for details about events that have already (in our fictional world) taken place. Time in storytelling is fluid. In J.K. Rowling’s second novel in her beloved Harry Potter fantasy series, Harry Potter and the Chamber of Secrets (1998), the students repeatedly hear unnerving noises coming from the walls of Hogwarts magic school. We only learn later [no spoilers!] the threatening source of these sounds, and its relevance to the broader struggle against the series’ main villain. The sounds in the walls thus create an ‘unknown identity or nature’ that fits our second definition of mystery. Practice leaving breadcrumb trails for your reader. In the famous fairy tale Hansel and Gretel, two siblings find a trail of crumbs in the woods that lead to a witch’s edible house (not knowing they’ll soon be on the menu!). The breadcrumbs in the woods are a physical hint (of the gingerbread house). The frightening sounds in the school’s walls in Chamber of Secrets are auditory details of foreshadowing. You can also use symbols that echo future events. For example, in Tolstoy’s Anna Karenina (1877) trains and train stations feature early in the story and play a central part in the story’s tragic climax and ending. Focus on foreshadowing mysteries and unknowns key to the story – the identity of a major or key secondary character, for example. Your reader won’t care what a character had for breakfast (though if they’re a cannibal, that might be something worth foreshadowing after all, as the reveal combines the mundane with the shocking or unexpected). The first definition of mystery, ‘secrecy or obscurity’ is important when we think about hooks. 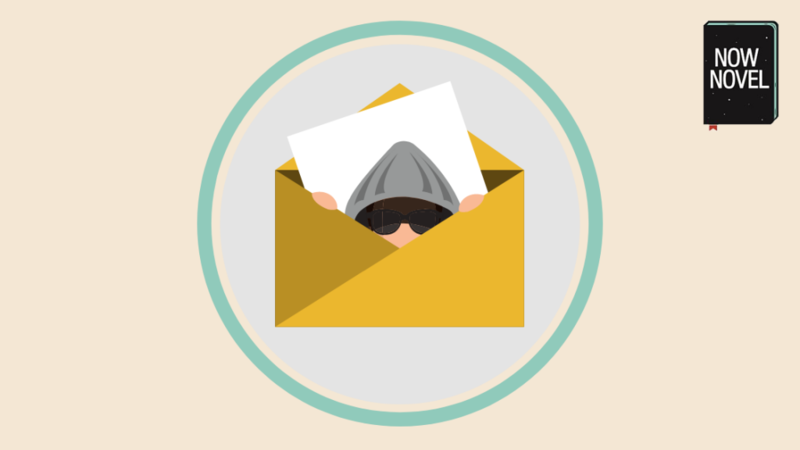 The ‘hook’ – the inticing sentence or paragraph that hints at where a scene, chapter or novel will lead – needs to have some of this secrecy and obscurity. There has to be an unknown whose revelation we, the readers, pursue. Even in this simple sentence, there is an intriguing hook. There is the second mystery definition: Identity is unknown (we don’t know who ‘we’ refers to). There is mystery of place, too. If the building ‘had once been the gymnasium’, what is it, now? Obscure points of reference (mysterious ‘we’, former gynamsium) supply multiple unknowns which in turn keep us reading the next line to solve the first, small mysteries. Whether you’re writing dystopian fiction, romance, comedy, or any other genre, remember to lead with lines giving your reader at least a little obscurity, a reveal to pursue. What we can imagine will or may happen (e.g the revelation of a murderer’s identity) is a crucial aspect of mystery in storytelling. Certain tropes or stock situations (‘The Approach of the Confident, Handsome Stranger’) might fill us with specific narrative expectations as readers. For example, we might expect the cocky-looking stranger to say a smooth yet corny pick-up line. 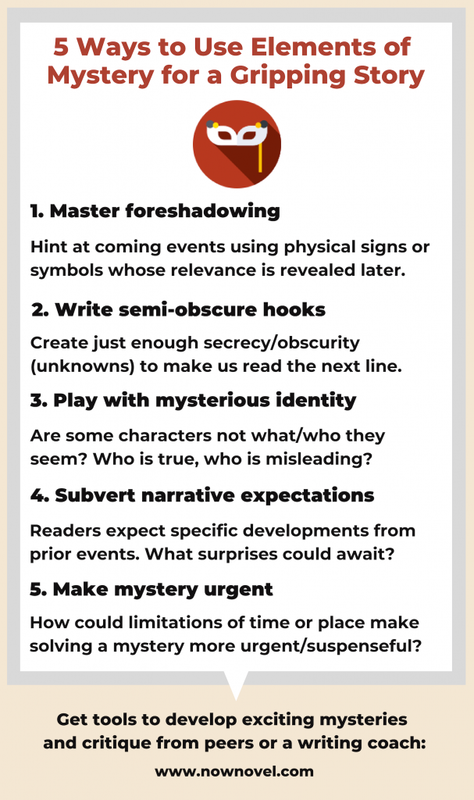 We create mystery when the story departs from or subverts our reader’s narrative expectations. Maybe the stranger in the bar opens his mouth to say something and has a debilitating stutter, for example. Surprise is one of the great joys of mystery, and storytelling in general. Set up expectations and choose some to confound, frustrate or subvert. Approaching mystery this way can help you come up with interesting surprises, contradictions and unexpected plot twists. In a mystery/thriller, urgency is a key element of what makes the mystery aspect gripping. When the mystery of identity involves a person who’s done a terrible thing (and could easily strike again), there’s greater urgency for them to be caught. There are higher stakes riding on their arrest. Even if the killer is the POV narrator, a twisted anti-hero, there are high stakes involved in their staying mysterious to police and investigators. The situation is reversed – it’s urgent that the unsettling mystery (to other characters) remains one. In each of the above examples, there is an urgent element to the mystery. The romance example gives time-dependant urgency. The man doesn’t have much time to make the connection he passionately wants. The second urgent mystery creates suspense through high-stakes mystery of place. The protagonists would need to locate the artefacts before the villain (this is a key plot point in the final books of J.K. Rowling’s Harry Potter books). In the third example, the mystery of how the man’s situation will resolve is made more urgent by the ticking time bomb that is the continued phone calls that could reveal his hiding place. Join Now Novel and get tools to plot your story’s intrigues and constructive feedback from peers or a writing coach to make them compelling and effective.